Now that the smoke has cleared from the last election, we’ve all had time to process what happened, think about what could’ve been different, and start prognosticating what to expect in 2020. The realignment is real, and in the 14 years I’ve worked in politics, I never thought the landscape could change so fast. Everything I thought I knew about who to turnout, to persuade, and where to spend resources efficiently has changed. 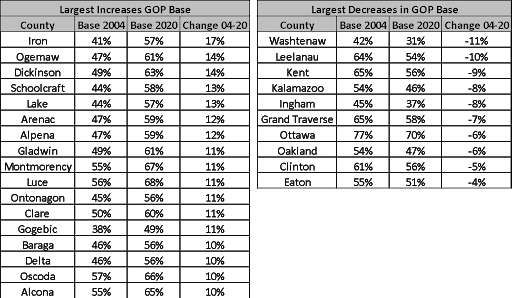 As a result, I’ve put together a few numbers and charts to help make sense of all the chaos, examine what happened, and look back at our last election cycle before the new redistricting commission has their say. Today, we’ll take a look at the ongoing realignment in the electorate. The more things change the more they stay the same. Between 2004 and 2018 the overall political base of the state had remained fairly static, with Democrats holding a 51-52% advantage over Republicans. The only difference was the distribution of the vote. In the 2004 graphic, you can see a lot more purple and light blue, especially in the UP. Flash forward to today and you can see that the majority of the UP has moved swiftly to the right, and upper Michigan which was once considered to be a swing area is firmly Republican. Only Leelanau and Grand Traverse County have shifted towards Democrats, largely due to the influx of downstate retirees. Between 2004 and 2010, the political outlook remained steady base-wise, until the election of Barack Obama and the tea party movement. Those events created a substantial shift in Michigan politics (further exacerbated by the election of Donald Trump), which completely changed many people’s party preferences, primarily based on socioeconomic status and other factors related to where they live, and certain values they feel one party better represents than the other. While the northern shift mentioned above has been a boon to Republicans, Democrats have made significant gains in more suburban areas, most notably in Oakland and Kalamazoo counties, as well as former GOP stronghold Kent County, which has shifted to essentially a swing county. This shift is evident in our most recent gubernatorial election between Democrat Gretchen Whitmer and Republican Bill Schuette. Since 2004, 17 counties in northern Michigan have seen a double-digit increase in GOP party base number, eight of which are in the UP. Of the 10 that had the largest decreases, some are not a surprise while others are a bit more shocking. It makes sense that Washtenaw has dropped so much, but the shifts in Kent and Ottawa are the most shocking. While Ottawa County is still very much in control of Republicans and will be for the foreseeable future, voters did elect a Democrat to the county commission for the first time in several cycles – an outcome that most people would not have predicted a decade ago. What the charts illustrate in very broad terms is the realignment we have all heard about. In some ways, it reminds me of a speech by former Senator John Edwards where he said there are two Americas. In Michigan, it is clear which areas of the state haven’t fully recovered from the great recession which has played a significant role in our state’s political shift. For instance, Democrats have moved towards the Republican party, or to Trump in particular due to economic changes. Specifically, there are industries that have not recovered from the recession as well as others due to environmental concerns (agriculture is an example), and increased foreign competition in the marketplace. Conversely, we also have areas that are thriving economically, where residents are unaffected by the closure of small factories and mining operations, while far more concerned about the environment and social justice. This constituency is more likely to have graduated from college and strongly leans towards Democrats. Additionally, residents in areas that have seen GOP growth have a more positive view of guns with a high concentration of traditional sportsmen, while suburban residents have far less access and traditional ties to hunting and gun culture in general. Part of the reason that there hasn’t been as much of a decline in GOP base in the 10 counties listed above compared to those that gained GOP support is due to the shift in suburban professionals that is offset by farmers and others living in rural areas in the same county. For example, where I live in Clinton County there has been a large influx of liberal residents in the Dewitt/Bath area, while everything north has become more conservative, keeping the shift more modest. This is similar to Eaton County with Delta Twp moving left, while the rest of the county moves right. These shifts should be a priority for political operatives in terms of campaign strategy. For Republicans, Oakland County, in particular, is no longer an area of strength and should be evaluated as such as races take shape for 2020. For Democrats, most of the state north of Isabella County has gone red. The UP in particular outside of Marquette is nearly out of reach. Moving forward, working the strong areas for each respective party, and performing well in the two big swing counties of Macomb and Kent will be the key to success.